For nearly two decades, academic institutions have been convening, consulting and collaborating with each other to determine how to confront their past, respond to their association with slavery and implement systemic repair. To do so, institutions have created memorials and have taken other actions of remembrance. Several institutions joined forces in the Universities Studying Slavery Consortium to conduct joint activities across university lines. 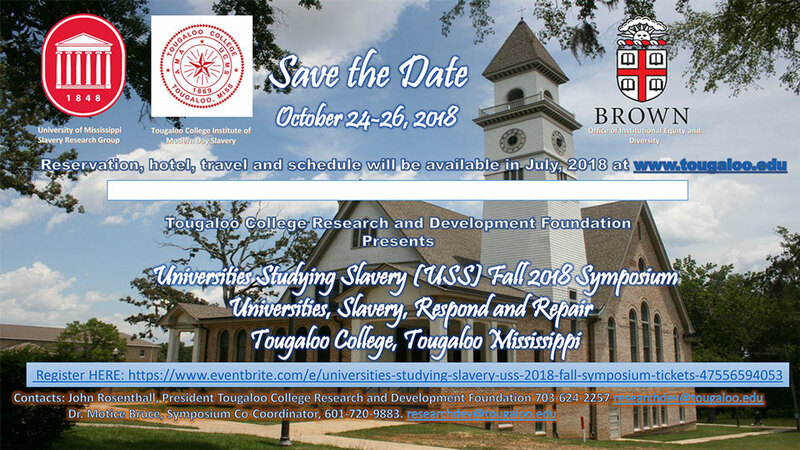 Tougaloo College, a Historically Black College or University (HBCU) that sits on five hundred acres of land for-mally known as the Boddie Plantation, will host the Universities Studying Slavery (USS) Fall 2018 Symposium with two days of discussions around remembrance and systemic repair. One systemic repair option argues that the best way to make repairs for slavery is for USS to work across institu-tions to expand the scope and impact of collective efforts. The first step has been to engage in a Repair Working Group with that institution that educates and moves more African Americans from poverty than any other – the community of Historically Black Colleges and Universities. The suggested next steps are to formalize the Working Group, then create working partnerships of USS, HBCUs and private entities to grow capacity, strengthen and make HBCUs financially sustainable. The Symposium will consider this and other systemic repair options. The Symposium Planning Committee is seeking papers, presentations and panels that discuss remembrance and systemic repair. Innovative strategies to strengthen HBCUs through research and contract partnerships and collab-orations are sought. Discussions of other systemic repair options and related topics are requested as well. Ab-stracts of no more than 500 words should be sent to researchdev@tougaloo.edu before October 1, 2018. Responses to all submissions will be provided on or before October 5, 2018. For additional information, please submit your inquiries to researchdev@tougaloo.edu. Symposium registration is open until October 10, 2018..
A limited number of rooms have been reserved at Drury Inn & Suites for the Symposium at $94 per night, single or double. Individual reservations can be made by reserving online, go to www.druryhotels.com, then enter Group number 2346731. Reservations may also be made by calling 1-800-325-0720 and refer to the Group number 2346731. Reservations must be received on or before Monday, September 24, 2018 to get the preferred rate. With a stay at Hilton Garden Inn Jackson/Madison in Madison, you'll be within a 15-minute drive of Tougaloo College in Tougaloo Mississippi. This hotel is approximately 10 mi from Tougaloo College and 13.6 mi (21.8 km) from Mississippi Civil Rights Museum. With a stay at Super 8 by Wyndham Madison/Ridgeland Area in Madison, you'll be within a 15-minute drive of Tougaloo Mississippi/Tougaloo College. This motel is 17.4 mi (28 km) from the Mississippi Civil Rights Museum and Mississippi State Capitol.